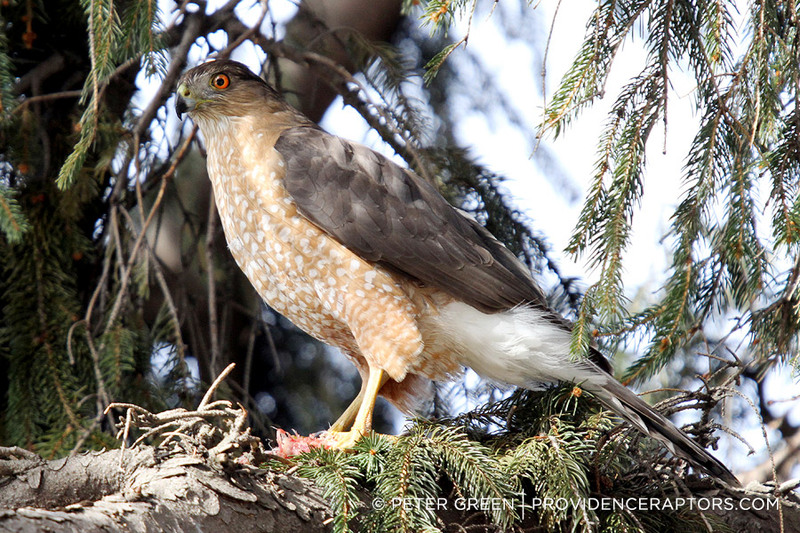 A Cooper’s Hawk can eat an amount of food equivalent to 12% of its body weight in one day. This is similar to a 120-pound person eating 14 pounds of food – or about four or five large pizzas a day! In the fall, females migrate south before males, but in the spring the males migrate north before the females do. 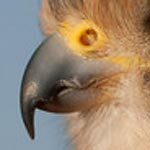 Juvenile Cooper's Hawks have yellow eyes, but the adults' eyes are red. 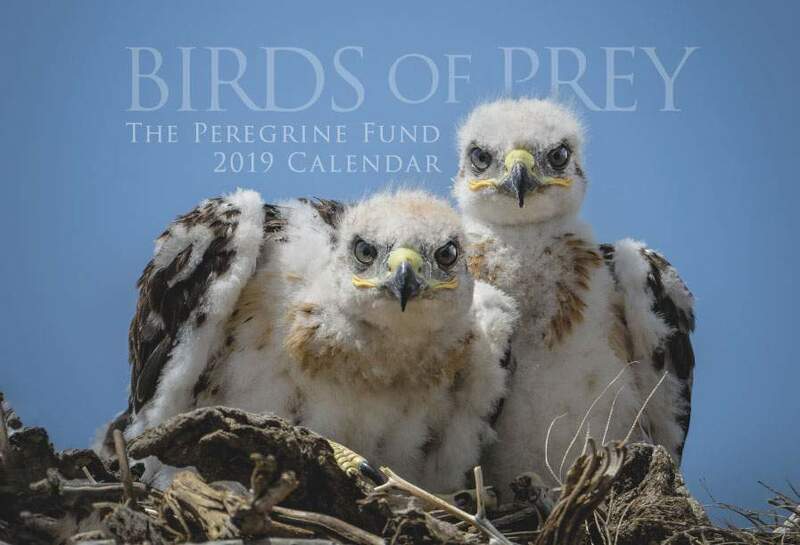 Though The Peregrine Fund doesn't work directly with Cooper's Hawks, our efforts in scientific research, habitat conservation, education, and community development help conserve birds of prey around the world. We also supply literature to researchers from our avian research library, which helps scientists around the world gather and share important information on raptor conservation. Native to the Americas, Cooper's Hawks are fairly common throughout their range. These medium-sized raptors breed from southern Canada all the way to northern Mexico. Some individuals remain in their home territory year-round, but those in the northern part of their range migrate to warmer areas when winter sets in and prey generally becomes harder to find. During migration, these hawks are known to fly as far south as Honduras, Nicaragua, Costa Rica, Panama, and even Colombia. The Cooper's Hawk is a forest species and can be found in a variety of habitats, including mixed and deciduous forests, open woodlands, small woodlots, riparian woodlands, open and pinyon woodlands, and forested mountainous regions. They can sometimes be seen perched in trees looking for prey or simply resting their wings. Nowadays, some Cooper's Hawks are also beginning to nest in residential areas and cities. 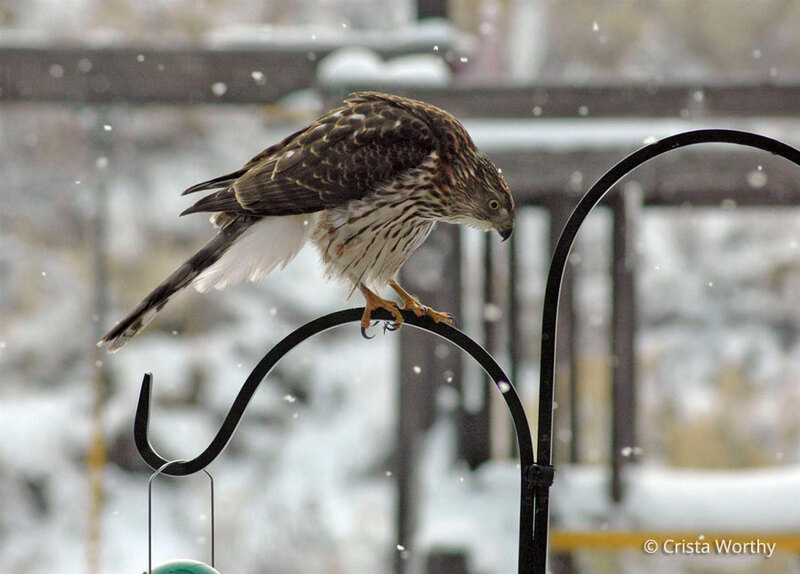 If you live in North America, perhaps there is a Cooper's Hawk living somewhere near you! 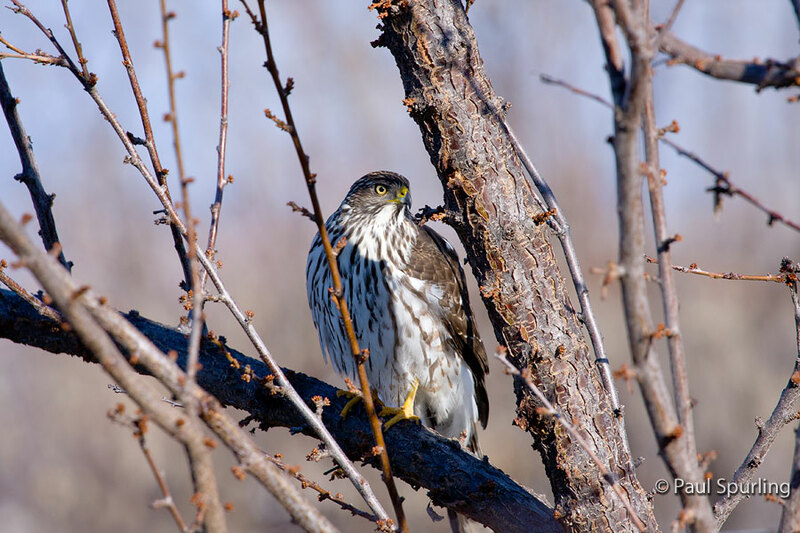 Be on the lookout for these raptors in trees, particularly around areas where songbirds and other prey may congregate. Its bluish-black back and wings and red eyes make the Cooper's Hawk one of North America's prettier hawks. Similar in coloration to the Sharp-shinned Hawk, but with a more rounded tail, the Cooper's Hawk is perfectly adapted to catching prey in a dense forest setting. Its rounded wings and long tail, which acts like a rudder on a ship, help the bird to maneuver through tight spots – such as a tangle of branches – to get at its quick moving prey. However, this forest species may slowly be making its way to cities. It is becoming more common in urban settings and in certain areas can sometimes be found nesting in trees not far from homes or other buildings. Though these hawks still prefer their natural forest habitat, an abundance of doves and pigeons, as well as smaller birds attracted to backyard bird feeders, are all tempting prey for a hungry hawk, especially in winter when food can be scarce. In the first half of the 20th century, Cooper's Hawks shared the fate of so many birds of prey in North America. Many were shot on sight because they were considered a threat to chickens and game birds, such as quail. In fact, Cooper's Hawks were often referred to by the unfortunate name of "chicken hawk," which didn't do much for their cause. Additionally, just like with so many birds of prey, including the Peregrine Falcon and Osprey, the use of DDT in the mid-1900s caused these birds to lay eggs with thin shells so that when the female sat on the eggs to incubate them, they often broke beneath her weight! This meant that very few young ever survived to hatching. As you can imagine, with fewer and fewer young hatching, there were no new birds to replace older, non-breeding adults or adult birds who had died. Today, their population has once again reached stable numbers, and they are considered quite common over most of their range. However, they still face many threats, including habitat loss, collisions with vehicles and power lines, and being shot. The Cooper's Hawk hunts a variety of prey and like most predators is highly opportunistic, meaning it will take a meal anyplace it can get it. Cooper's Hawks are primarily bird hunters and have been known to hang around backyard bird feeders, where songbirds gather in tempting numbers. They generally hunt small- to medium-sized birds, including doves, quail, and woodpeckers. They may also catch bats, mice, and squirrels, and less often even frogs and snakes. They have been known to take an occasional fish and even other, smaller raptors, such as the American Kestrel. Being able to adapt to hunt a wide variety of prey is one key to their success. When on the hunt, the Cooper's Hawk often patrols forest edges and clearings and uses stealth to sneak up on prey in a surprise attack. When prey is spotted, these agile hawks pursue it with a great burst of speed, often moving quickly and deftly through tree branches. This is a dangerous style of hunting. These birds are moving at top speeds and if their wings, head, chest, or any other body part accidentally collides with a branch, they could seriously injure themselves or worse. It takes a lot of skill to maneuver through dense forests while keeping their eyes on their quarry. 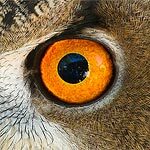 Imagine trying to run an obstacle course at top speed while trying to catch a pigeon and you will get some idea of what Cooper's Hawks go through every day simply to survive. Unlike falcons, such as the Orange-breasted Falcon, Cooper's Hawks do not have a notched bill that can be used to kill their prey. 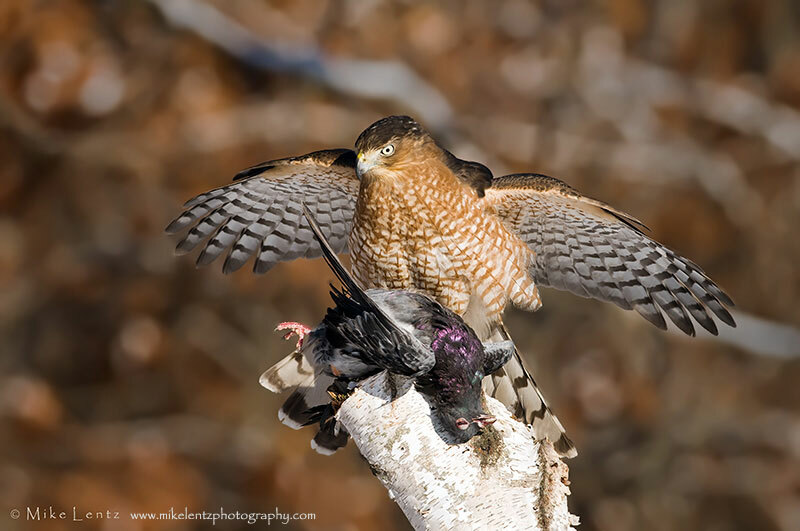 Instead, a Cooper's Hawk squeezes its prey with its sharp talons and strong feet. There are even reports of some individuals drowning their prey by holding it underwater until it dies. During courtship, Cooper's Hawks participate in display flights that usually involve slow wingbeats and soaring. This helps create a strong bond between the male and female. When it comes time to build the nest, the male Cooper's Hawk does the majority of the work. He builds a broad, flat stick nest in a tree, usually somewhere near the trunk. A pair of Cooper's Hawks rarely reuses the same nest twice, so every year the male must build a new nest. Though these hawks tend to nest in forest settings, recently biologists have documented this species nesting increasingly in residential developments. In fact, one nest was located in a small plot between two houses that were only 30 feet apart! Once the nest is built, the female lays 3-6 off-white eggs. She is the one mainly responsible for the care of the eggs, which means she sits on them for most of the day to keep them at just the right temperature so that the embryos can develop into healthy chicks. She must do this every day for approximately one month! While the female is incubating, the male is responsible for providing the majority of food to the female and their offspring. And hatchling Cooper's Hawks grow very quickly, whcih means they need to eat a lot. After just 4-5 weeks, the young hawks are ready to take their first flight. Like most other raptors, these first flights can be tricky and often young birds are unskilled at landing. However, in a short time they become swift, skilled fliers just like their parents. The diligent parents continue to bring prey to the young for about seven weeks. After that, the young birds are able to hunt for themselves and leave their parents' territory. After that, it is up to them to make it one their own. Life for a young raptor can be very tough and usually 70-80% of all young raptors die before they reach adulthood. Some starve, others may be injured while chasing after prey, and still others succumb to disease or collisions with cars or power lines. Some may be harmed by humans. Cooper's Hawks generally are ready to breed and have young of their own when they are about 2 years old. Found year-round throughout Idaho, the Cooper's Hawk population in this state appears to be relatively stable. Birds that live in the northern part of the state may migrate to warmer parts of the world during the colder winter months, but they return again each spring to begin nesting. They can be seen in southern Idaho and have been observed around the World Center for Birds of Prey and along Boise's Greenbelt. Cooper's Hawks have been spotted soaring the skies over the World Center for Birds of Prey or perching in trees around the visitor center. During your visit, be sure to walk the interpretive trail or keep an eye on the sky as you drive up the entrance road – you may get lucky and spot one of these speedy hawks during your visit.